Our Pave Elephant Ring is a picturesque combination of artistry and metal work all in one. 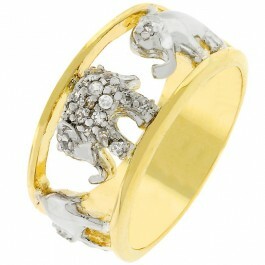 This piece displays two tones of gold and silver with pave elephants to form a beautiful ring. 14k Bonded Gold is achieved using an electroplating process that coats the item with heavy layers of 18k Yellow Gold and color-treated to a perfect 14k Hamilton gold color. White Gold Rhodium Bond is achieved using an electroplating process that coats the item with heavy layers of rhodium, a close cousin of platinum that costs three times as much, which gives our jewelry a platinum luster.